The Symposium explores emerging trends and novel ideas and concepts covering a broad range of topics in the area of VLSI: from VLSI circuits, systems and design methods, to system level design and system-on-chip issues, to bringing VLSI methods to new areas and technologies like nano- and molecular devices, hardware security, etc. 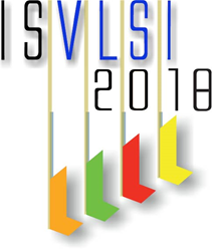 ISVLSI 2018 highlights a special theme of Internet-of-Things. Future design methodologies are also one of the key topics at the Symposium, as well as new EDA tools to support them. Over three decades the Symposium has been a unique forum promoting multidisciplinary research and new visionary approaches in the area of VLSI, bringing together leading scientists and researchers from academia and industry. Selected high quality papers from ISVLSI 2018 will be considered for two Journal Special Issues: 1) IEEE Transactions on Nanotechnology (impact factor 2.485), and 2) IEEE Consumer Electronics Magazine (impact factor 1.153). The Symposium has established a reputation in bringing together well-known international scientists as invited speakers; the emphasis on high quality will continue at this and future editions of the Symposium. ISVLSI 2018 has successfully concluded in Hong Kong on July 8-11, 2018. We sincerely thank our keynote/plenary speakers, our presenters, our chairs, all the participants and our sponsors for their support and contribution. Check out our gallery for the conference photos! ISVLSI Conference papers will be delivered electronically online through the following link. We will send you the login ID and password through your registered email address. MEHK has kindly sponored free addmission tickets to Happy Valley Racecourse and beer redemption coupons. You can get a free ticket and a coupon at the ISVLSI reception counter on a first-come, first-served basis. The Happy Valley Racecourse (跑馬地馬場) is mainly opened for night race that takes place on Wednesday. If you haven’t watched horse racing, especially horse racing in Asia, this is the place to go. 1. You have a display area sized 90 cm tall by 110 cm wide. You are free to use this area in any way (e.g., one large poster, multiple sheets, etc.). 2. Thumbtacks (pushpins) will be provided to hang your poster. Do not use foam core material for your poster or any other thick/heavy material. 3. ISVLSI does not provide output or production services. 4. Please remove your poster/display after the poster session. Otherwise, the pages or poster will be discarded. A poster template can be downloaded through the button below. Please note that visitors from most countries can enter Hong Kong without a Visa. But if you do need a Visa supporting letter, please contact the registration chair, Prof. Weichen Liu (liu@ntu.edu.sg). In your email, please list your contact information. If you are an author, please specify your paper title as well. If any special format requirement of Visa support letter is required, please also tell us in the email. Welcome to Hong Kong and we are waiting for you at ISVLSI conference venue. As a Special Administrative Region of China, the visa policy of Hong Kong is different from Mainland China. Visitors from most countries can enter Hong Kong without a visa for periods of 7 to 180 days, depending on nationality. However, you are strongly recommended to check with the Hong Kong Immigration Department for details about visa requirements.